We’ve seen it time and time again. Despite the popularity of Twitter and its ability to connect brands with their audiences, some companies still have inactive Twitter profiles. On a positive note, things are starting to trend upward a bit. Back in 2012, only 73% of Fortune 500 companies had active Twitter accounts. Today, that number is up to 83%. That means the top companies realize the importance of participating on Twitter, instead of just being a dead profile. So what exactly is your business missing out on by not engaging? And what can you do to improve your Twitter activity so that it’s a useful tool instead of a burden? Let’s see! Twitter feeds off interactions more than any other social network. It’s very conversational with people asking questions, sharing content and having fun in the occasional Twitter Chat. And the most important thing to keep in mind is that Twitter moves extremely fast. You can’t afford to be stagnant and M.I.A. for long periods of time, because you’ll more than likely be forgotten. Get feedback: If there’s one thing consumers like to use Twitter for, it’s to voice their opinion. The beauty of Twitter is you get natural, raw and unfiltered opinions because it happens in real time. 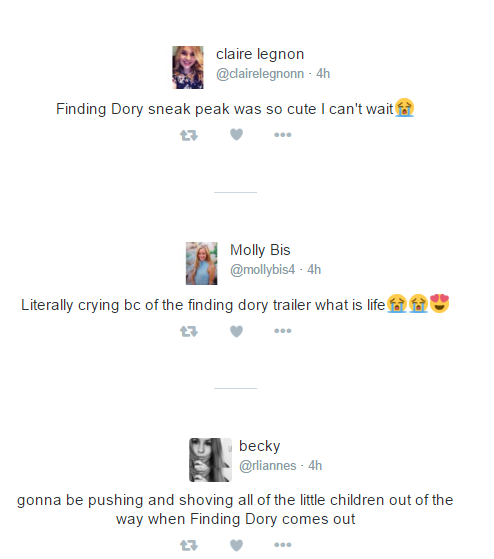 For instance, when Disney released the first trailer for the highly anticipated Finding Nemo spinoff, Finding Dory, the feedback was instantaneous on Twitter. Humanize your brand: We’re living in the age of transparency in business. Consumers are tired of faceless corporations and want to know who they’re buying from. Twitter gives you the opportunity to make that connection by showcasing your brand’s personality and character. 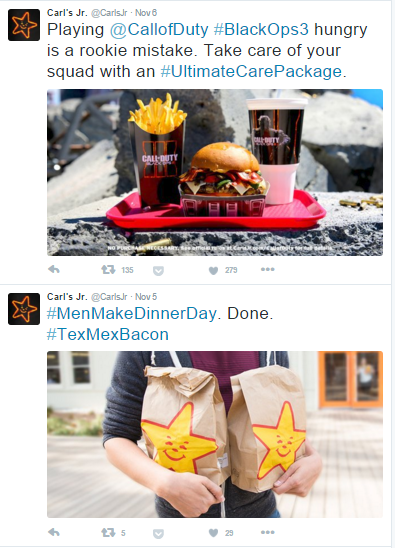 The Carl’s Jr. Twitter Stream is filled with entertaining Tweets with plenty of pop-culture references that people can relate to. Handle bad PR: Any type of negative publicity that could be associated with your brand eventually seems to find its way to social media. Luckily with Twitter, you have the chance to negate potentially bad situations before it completely ruins your brand’s image. You don’t have to call a huge press conference, you can just send out a Tweet to clarify your stance. It helps if you have a PR-focused social media manager on your side! 74% of people who follow small and medium sized businesses do it to updates on future products. Consumers aren’t just following you for fun. They want to hear from you and be up to date on what you’re doing. Twitter is one of the easiest and quickest ways to disseminate information to your audience. By refusing to stay active, you’re harming your business and also letting down potential customers. Having an active company Twitter account is a necessity. But that doesn’t mean it stops there. In order to broaden your reach and connect with your audience even more, consider getting members of your team engaged on Twitter too, including your top level executives. At the very least, the people who handle the marketing aspects of your company should be active on Twitter. We’ve seen top chief marketing officers like Phillip Schiller from Apple and Beth Comstock from GE gain a lot of success with their personal accounts. They don’t just Tweet product updates and PR related information. They’re successful because they share information that’s relevant to their audiences. Having this mix of people allows you to amplify any campaigns you do in the future and share your content to a wider audience. Also, more hands on deck means your company as a whole is able to reply to incoming Tweets quicker and provide better service. If you’re new to Twitter or you’ve had an account for a while but never did anything with it, you’re probably wondering what you should start doing to get some activity flowing. First, do a search to see what people are already saying about your company. You can either use Twitter’s search feature or take advantage of Sprout’s more advanced search tools. Do a few searches for your company name and any possible variations. With a quick search for “sprout social?”, we immediately see an opportunity to engage with a potential customer. Notice how we included a question mark in the search query. This narrows down the results a bit so we see more Tweets about people who have questions or concerns about the company rather than just those sharing our content. Once you’ve done your searches, you’ll have a great starting point to reply to existing Tweets. Save some of your best searches so that you can go back to them and reply to new Tweets on a daily basis. The list of blogs you’re collecting will be where you source your curated content from. It makes it much easier to be consistent and active when you don’t have to fumble around searching for content to share all the time. Just head to your list of sites and share their latest posts. Lastly, you can start initiating conversations with other people on Twitter. This is something that business owners either don’t think of doing or they feel it’s intimidating. But if your Twitter account is relatively new and you don’t have a huge following, taking the time to start conversations will help you build some initial momentum up fairly quickly. 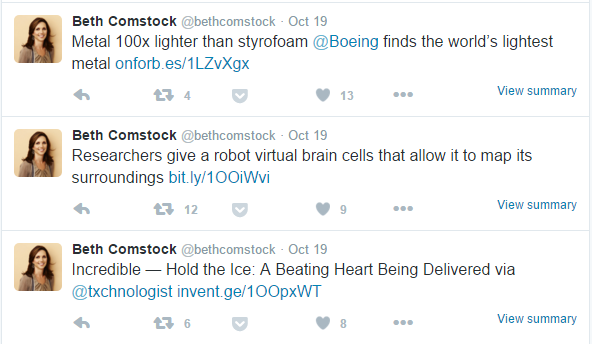 To find people to Tweet to, search for different phrases related to your industry. Then start engaging with them by replying. And you can always look at Tweets about trending topics and engage with those too. This seemingly small move can have a big impact over time. After you monitor your Twitter for a while, you’ll begin to see activity build up on your account. You want to be able to analyze that activity so you can see what you’re doing right and just as importantly, what you could improve on. You’re going to need a Twitter dashboard for this. Sprout’s dashboard will give you all of the data you need. This information is useful because you’ll have a much better idea of how you need to adjust your Twitter activity. For instance, if you notice your number of Tweets including photos has gone down and so has the number of Retweets you’re averaging, it could be a sign that you need to start publishing more images instead of just links or text. 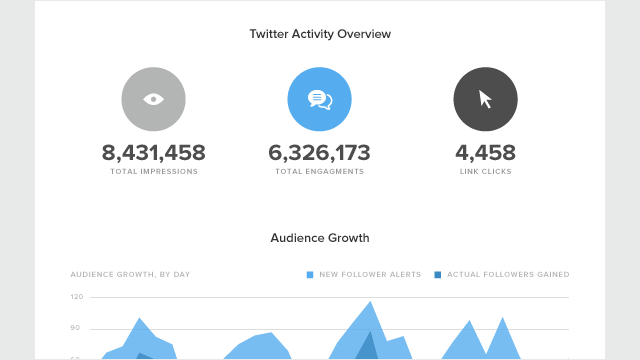 You can go even deeper and analyze your engagement report, to see things like your response time and rate. If your response time is really high, then your followers might get the idea that your account isn’t active. So instead of voicing their opinions on Twitter where you’re able to respond immediately, they may just go directly to their friends or review sites, which makes it more difficult to resolve their issues. And on top of that, you’ll be giving them a reason to unfollow you. Your Twitter activity is largely going to depend on your audience, and you’ll begin to learn what they connect with the most over time. It all starts with being present though. Don’t let your account end up in the social media graveyard alongside companies that haven’t Tweeted since 2013. Show your audience you want to engage with them and take advantage of all the benefits Twitter has to offer.